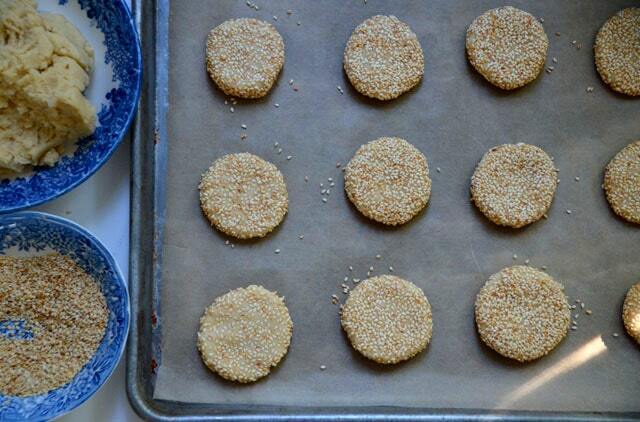 If there is one cookie I want to eat every single day, it’s my crunchy sesame seed cookies. So crisp, light, and nutty, they are a perfect combination of flavor and texture. Keep the cookies in an airtight container. I used to travel what seemed like a major hike north in Chicago to get my hands on the sesame biscuits at Al-Khyam up on Kedzie. Distance is all relative, that’s for sure, and that ride always seemed like an effort, like traveling, like a pack-your-bags kind of a trip. There is a whole strip Middle Eastern shops, but Al-Khyam is over the top with its imported groceries and a bake shop extraordinaire. It was here that I had knafeh for the first time, and here that I made an appearance on WTTW, on a show about delicious Chicago that still runs today. Here too that I realized that the thin pita bread that is my heaven is made that way by machine, and by machine only. George Mounsef, who owns Al-Kyham, is Lebanese, and he imported the pita-making machine from Lebanon himself. It’s a showstopper kind of a place, a gem. I loved tinkering around in there making discoveries of new and interesting Lebanese treats that hadn’t made it to me other ways, through the family. Among the best of those treats were the sesame biscuits, a box of what had to be 20 cookies that I would buy and eat a great many, too many, on the “big drive” back to down the city to my condo in Lincoln Park. I tried to save just a few to eat at my desk at work during the week. 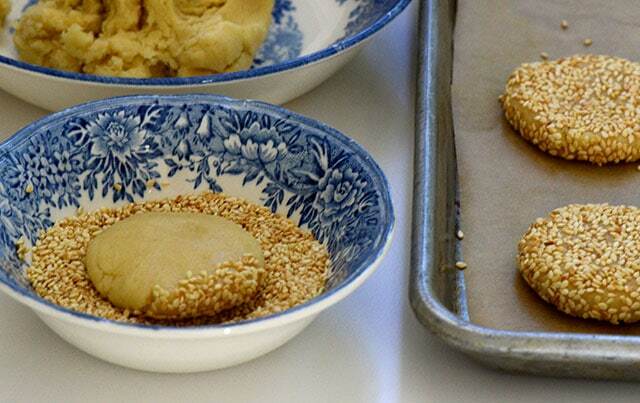 These are cookies that define addictive, for their crunchy texture and serious sesame flavor. Didn’t matter that the toasty sesame seeds, which form unabashedly the exterior layer of the biscuit (more the better), shatter and get all over the car seat. Didn’t matter that the crunchy cookie would drop its crumbs in my lap with every bite. I’m pretty sure that whoever is using the keyboard now that I had at my desk in my office in Chicago finds sesame seeds in it every now and then. To her I say, you’re welcome. I’ve been itching to figure those biscuits out, missing them so very much from my repertoire of yum. 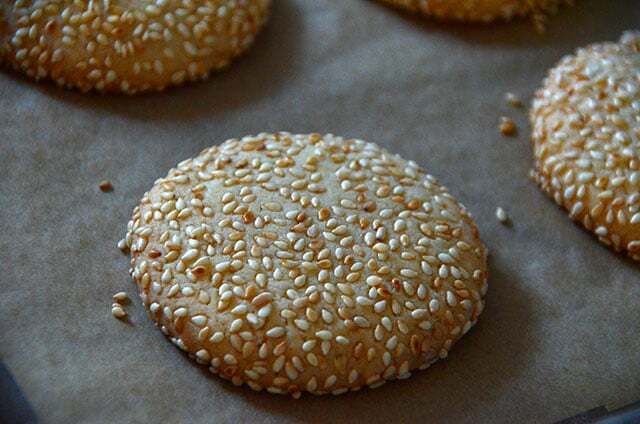 There is a classic Middle Eastern cookie called barazek that is one side sesame, the other pistachio, and I noticed the recipe for that on the bag of sesame seeds from Ziyad. Those are similar to what I was aiming for, but not quite, and for now I need to satisfy my straight-up sesame cookie obsession. Here’s a darn good start, a simple dough formed into a ball, flattened and dipped in sesame, then baked until dry and crunchy. Al-Khyam’s sesame biscuit cookies are shaped in a beautiful “S,” a style I’d like to replicate (you know I love detail) but that’s an effort that is nowhere near necessary to find our way to sesame biscuit-loving perfection. 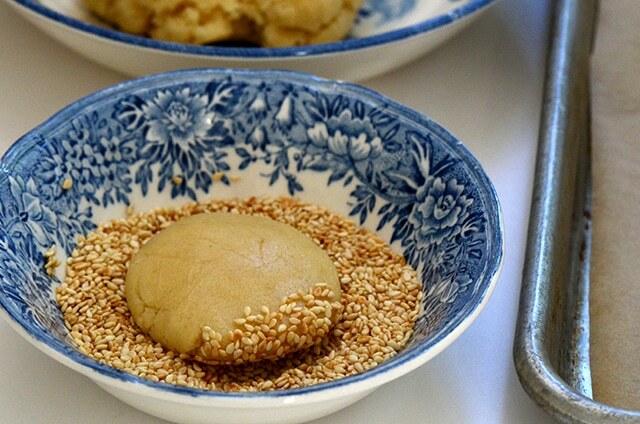 Many methods I tested called for mixing the sesame with honey and somehow spreading that mixture or dipping the dough in it. What a mess. My simple method gets the sesame to cling easily to the cookies, and then gets the cookies done and into your mouth—and onto your lap, your chair, your keyboard—in no time. These biscuit-like cookies are addictive! Such crunchy texture and nutty sesame flavor. Keep the cookies dry by storing them, immediately after cooling, in an airtight container. They’ll last several weeks that way. The dough is best used to shape and bake the cookies right after it’s made. Place oven rack in the middle of the oven, and preheat the oven to 375˚F. Line two heavy duty sheet pans with parchment paper. 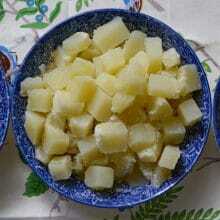 In a small bowl, whisk together the flour, cream of tartar, baking soda and salt. Using a stand mixer fitted with the paddle attachment, or a hand mixer, beat the soft butter with the sugar on high speed until well combined and fluffy, about 2 minutes. Add the egg and vanilla and beat on medium speed until combined. Slowly add the flour mixture and beat slowly on low speed, then increase the speed to medium and beat until the mixture comes together. The dough will be very dry and still showing flour. Add the milk and beat until a soft dough forms. Place sesame seeds in a small bowl. 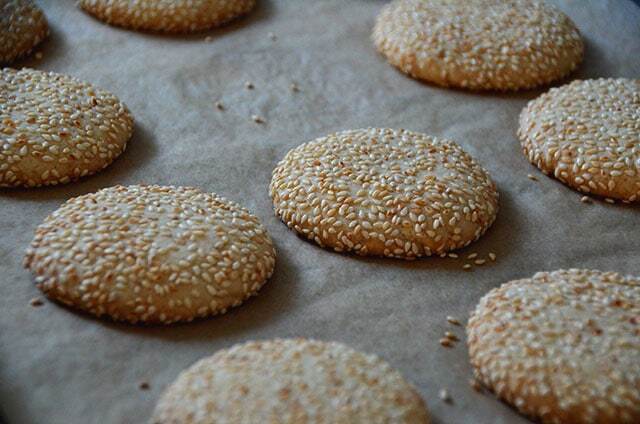 Shape about a tablespoon of dough into a ball and flatten to about ¼-inch disk, Press the disk into the sesame seeds, turning over and onto its sides to coat completely with sesame seeds. Repeat with the rest of the dough and sesame seeds. Place the cookies about an inch apart on the sheet pan, baking the first pan as soon as it is ready and continuing to make the second pan of cookies while the first one bakes. Bake the cookies for 14-16 minutes, until golden brown, rotating the pan halfway through baking for evenness. Remove the pan from the oven and cool the cookies completely; they will firm up and get crunchy when they are cool. Store immediately in an airtight container. 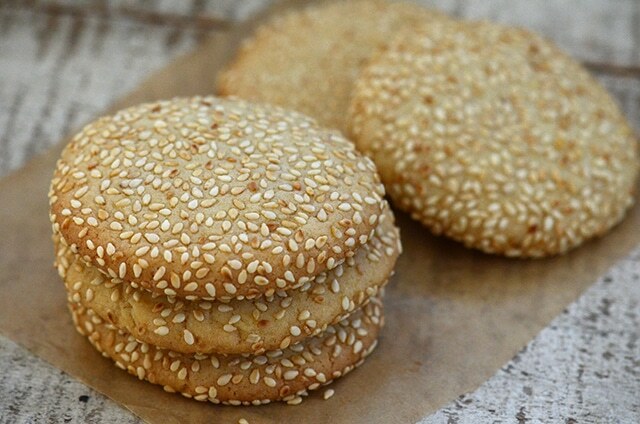 19 Responses to "Lebanese Crunchy Sesame Cookies"
These look a lot like Italian gigolene cookies ! Oh, wow! I can’t wait for the weekend to arrive so that I can bake these. They look simply delicious. My mom’s side of the family is Lebanese, and I don’t think they know about these wonderful cookies. Thank you so much! Dear Maureen: I finally baked your delicious sesame cookies for yesterday’s Sunday family gathering. They were a big sensation simply and flew off the plate! Everyone wants your recipe now, hehehe. Thank you very much for sharing your knowledge with such generosity. Carlos, that is just wonderful! Thank you so much for sharing (with me and with your family!)! LOL on your seeds inbetween the keyboard. I did the same thing just before sitting down – to search the web for a recipe for the cookies I bought yesterday – aka barazek. I have all the ingredients – and will give these a try to serve up to family on Sunday (yes – I’ve already enhaled the 12 I purchased). Luckily, as a T1 diabetic (a whore to insulin for past 50 years) – I am able to eat these cookies without my blood sugars going to wonky – well at least the ones I purchased didn’t 🙂 I’ll give you a heads up on how they turn out!!! Please do–I’ll look forward to hearing about it! can you freeze these cookies…and can i use toasted sesame that i purchased in a container? Hello–yes, you can use purchased toasted sesame! I haven’t frozen these before but if you wrap them tightly and in an airtight container, they should hold fine frozen. gracias por compartir esta receta hoy comi unas galletas de sesamo pero las de usted se ven mejor voy a hacerlas pues este estilo se ven deliciosas. i grew up eating these and they’ve always been a favorite of mine. 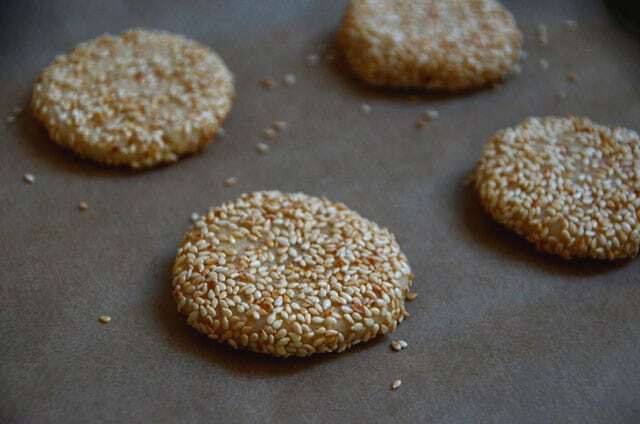 this summer i grew a large patch of sesame plants and when the harvest came in, all i could think about was Lebanese sesame cookies. i tried your recipe and it is excellent! it was exactly what i was looking for. thank you, Maureen! I have been making a very similar cookie like this for years, and it is up there close to #1 in favorites. The recipe I found was in Joy of Cookies, and has some anise extract in them. And I know about finding sesame seeds, everywhere! Just delicious cookie. How do you store these to keep them crisp? I can’t seem to get them to stay crispy and that’s my favorite part. I keep them airtight and that does the trick! 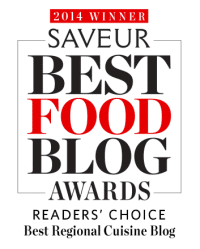 My father was Syrian & my mother Austrian & a amazing cook especially Syrian food. We made these cookies but shaped them like little torpedos(like little kibbees). We baked them then when they came hot out of the oven dipped them in cold baklawa syrup & rolled them in sesame seeds or ground walnuts. So delish & seeds & nuts stay on better. Looking for a recipe for a sweet Syrian bread we called cross & bus bee my moms copy is so worn out. It was made in loafs like bread Araby not pita it uses 12 eggs, lots of clarified butter & mahleb. When you roll out the loaves u prick it allover with a fork. Its rich, sweet ,short& oh so good. Always made it at Easter. would love it if anyone has this recipe. 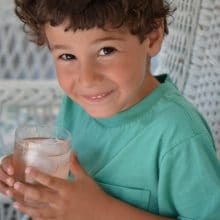 I’ve been looking for this recipe forever, and this is it, so close to exactly what my “sito” made! She formed the S-shape you referred to in the article above (in fact, that’s what made me stop and try the recipe…), but she also formed the cookies into a twist. 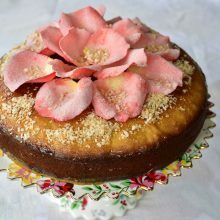 My mother thinks that she added just a touch of rose water to the recipe, but I haven’t tried that, unwilling to mess with the perfection of your recipe! Ohhhh, this recipe is a keeper! The perfect, just-sweet-enough cookie for coffee! They don’t last long, either, by which I mean that my husband and grandsons devoured them in an afternoon (minus the ones I hid, shhhh…).